About 25,000 householders who own a property currently valued at between €180,000 and €270,000 would see their bill jump by €135. The majority of those to be hit with the steep rise are living in rural Ireland, rather than Dublin where property prices have recovered most since the recession. After more than a year of work an interdepartmental group has provided the minister with five options for changing how the Local Property Tax (LPT) is calculated. Households currently pay the charge based on the value of their home in 2013, even though prices nationally have risen by about 80pc in the interim. The report urges the minister to implement a re-evaluation of properties on November 1 as a delay "may present risks to the long-term stability of the tax". But Mr Donohoe said he was not prepared to make changes until late 2020, meaning tax increases won't take effect until 2021. This pushes the debate beyond the likely date of the next general election. Fianna Fáil's finance spokesman Michael McGrath said the delay was "undoubtedly a decision taken for political reasons in advance of the upcoming local and European elections". "The Government has decided on the easy option of kicking the can down the road rather than bringing in the reforms that are needed," he said. The minister said he would use the next six months to try to get "consensus" rather than a plan that could be amended by Opposition parties as it went through the Dáil. He also cited the local elections as a "particular challenge" because new councils would need clarity when they began setting their budgets over the summer. The stalling means an "inequity" that sees almost 50,000 homeowners escape the LPT will continue. The Review Group states that exemptions should be "kept to a minimum" and recommends ending a number of 'special cases'. These include first-time buyers who purchased their home in 2013. They will not now pay LPT until 2021 at the earliest. All five scenarios presented to the minister involve raising €500m for local authorities. Officials said every approach involved "winners and losers". The option favoured by Mr Donohoe would see the existing valuation bands widened by 80pc to reflect market changes. The tax rate would then be lowered from 0.18pc to 0.1pc in order to leave the liability in each band unchanged. This would ensure no properties gained from a decrease in the charge while 82pc would see no increase. Three-quarters of those escaping an LPT hike would be outside Dublin. Some 16pc of properties, primarily in the capital, would see an increase of up to €100. But another 2pc whose homes are among the cheapest in the country would see an increase of €135. Well over half of these are outside Dublin. 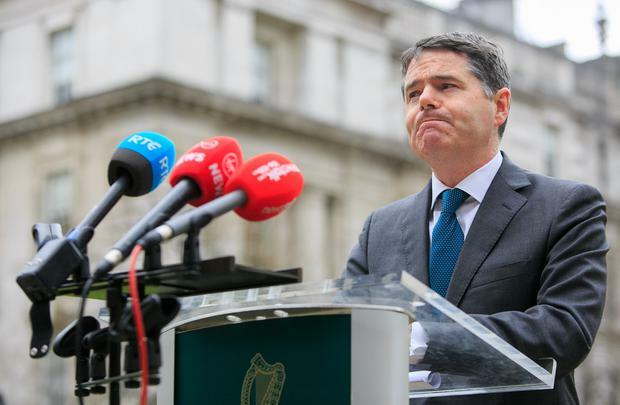 Asked about his preference for this scenario, Mr Donohoe insisted he was not committing himself to any band or thresholds laid out in the interdepartmental report. "I'm saying there is a model there that could be made work," he said.